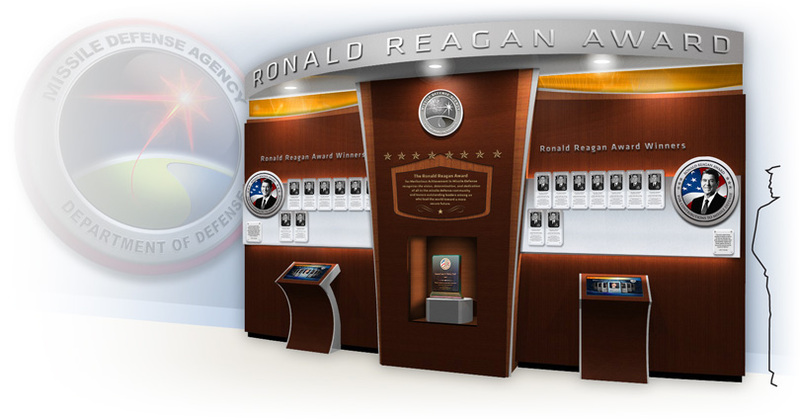 We’re proud to be the creative vision behind this project that captures the history and celebrates future advances for the Missile Defense Agency through environmental design, exhibit design, video production, and interactive kiosk. We just can’t show you much because it’s in a secure building on a secure base. It’s patriotically awesome… check out a sneak peek below. 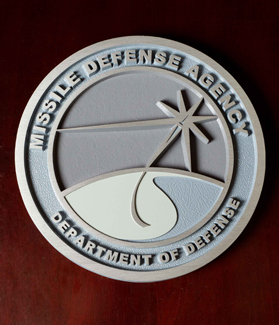 The Client’s Directive: Feature our products to tell the Missile Defense Agency’s story to both employees and visiting dignitaries through a cohesive design for environmental graphics, video, and a way to feature award recipients and agency directors and allow for future additions. The Situation: Von Braun III was under construction on Redstone Arsenal and was slated to be headquarters for the Missile Defense Agency. The challenges included the not-quite-finished six-story, 640,000 square-foot building with interior finishes that changed mid-project. Oh yeah, high security areas that made getting access and details complicated throughout the 15-month project. The McComm Solution: At the heart of MDA’s RFP was the need to communicate a complicated, technical, evolutionary story that started in WWII and will continue into the future. This project touched on all our strengths and the result is a headquarters that accomplished the leadership’s goals, celebrated the contributions of employees, and makes us proud to have been a part of the process. Each year since 2003, MDA has awarded its highest honor to an individual whose career has significantly impacted missile defense. The Ronald Reagan Award winners include secretaries of state, ambassadors, private sector business leaders, and military leaders. McComm designed this beautiful wood and brushed chrome kiosk to showcase these Americans prominently in a self-contained display in the main lobby. Because a new recipient is added each year, room for logically adding to the display was important. 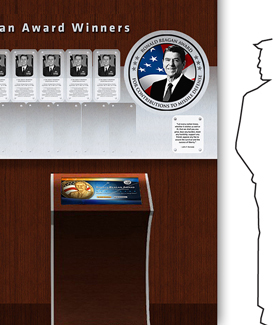 In addition to the static display, we developed the interactive component for the touchscreen kiosks, featuring biographical sketches and career highlight videos for each award recipient. With six floors of diverse common spaces as our canvas, the underlying theme we adopted was to convey the achievements of the workforce and to provide information to visitors about the scope and technical advancements of MDA. These informational and inspirational graphics filled all entrance and elevator lobbies as well as a sweeping view of the mezzanine lobby on one of the executive floors. Graphics for outside the auditorium focus on MDA’s diverse workforce. 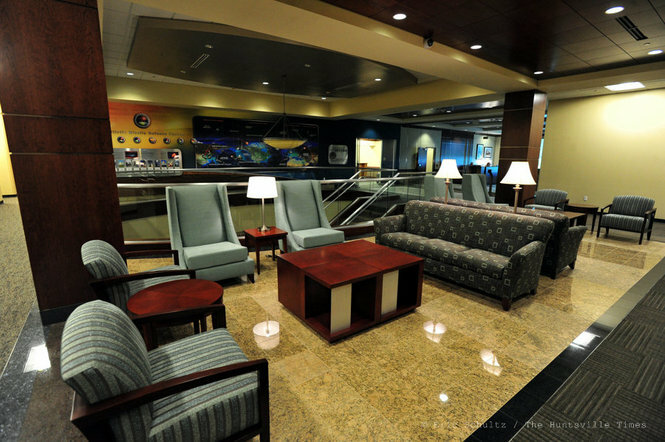 The agency’s history and leadership are the focus in the main lobby. The McComm Group selected artwork for the onsite fitness center, cafeteria, pressroom, and executive offices waiting areas. Additionally, we conceptualized a fun nod to Werner Von Braun himself with the coffee shop we dubbed “Rocket City Café.” We designed a faux window for the café, looking out over Von Braun being carried on the shoulders of Huntsvillians in the 1960’s after a successful rocket launch. A more serious acknowledgement of Dr. 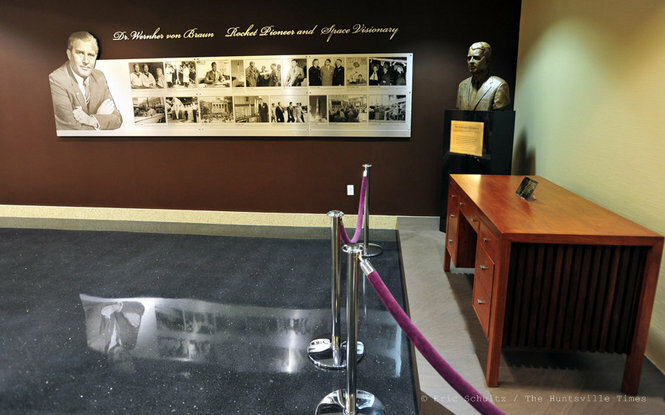 Von Braun is highlighted off the main lobby in a display we created that features his desk and biographical information about NASA’s first director. A primary feature of the main lobby is an historical video the McComm Group created. After extensive research into the technological and political milestones in the missile defense industry, dating back to World War II, the McComm Group wrote the script, acquired historical photos and available video, designed the graphic interface and produced the video in a by-decade timeline approach that allows for future additions as new milestones are achieved by MDA.